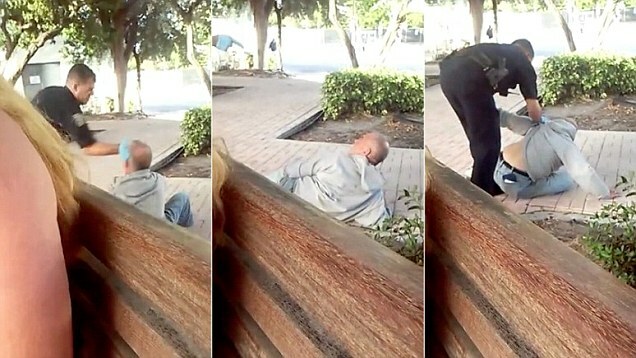 FORT LAUDERDALE — A video released online shows a Fort Lauderdale police officer slapping a homeless man across the face after he sought to use the restroom at the public bus station, adding to existing concerns over the city’s questionable treatment of the homeless. The video begins by showing the man, Bruce Leclair, walking through the Broward Central Bus Terminal, while nine-year veteran police officer Victor Ramirez follows behind, putting on a pair of blue disposable gloves. Moments later, Ramirez approaches Leclair and reaches out for his arm. Leclair pulls away, and after a few seconds of dialogue, Ramirez shoves him to the ground. Leclair curses at the officer. “I want to go pee,” Leclair replies. He then tells Leclair that he will put him in the police car if he resists, and orders him to get up off the ground. Seconds later, Ramirez slaps the homeless man across the face. The sound of the smack cracks out, and the person recording the incident gasps. Leclair is taken into custody and transported to jail, where he was taken in on trespassing charges. He was later released. But Feldman was also asked during the conference whether he believes the city has a track record of mistreating the homeless as other incidents have been reported in the past. “Does the city have an image problem when it comes to homeless issues, would you say? And does this contribute to that?” the reporter asked. In January, the Fort Lauderdale branch of Food Not Bombs filed a lawsuit over the regulations as it had been feeding the homeless each week in Stranahan Park. Two others who regularly feed the homeless, 91-year-old Arnold Abott, who made headlines after being arrested in November, and Episcopalian Mark Sims, who was among the first to be charged, have likewise filed suit. Food Not Bombs, the Peanut Butter & Jelly Project and Love Thy Neighbor held a rally earlier this month in an effort to oust the current mayor, Jack Seiler, who supports the current regulations. Seiler has been silent about the Ramirez-Leclair situation and was absent from Tuesday’s press conference. Some businesses have stated that the homeless take away from the economy and tourism.